Departure 8:09 Friday morning, luggage stowed, Erin, Anah and I in the car and off we went - destination Ashland, Wisconsin. The first 10 hrs went well. We've traveled a lot of miles together and remain harmonious even trapped in the car. 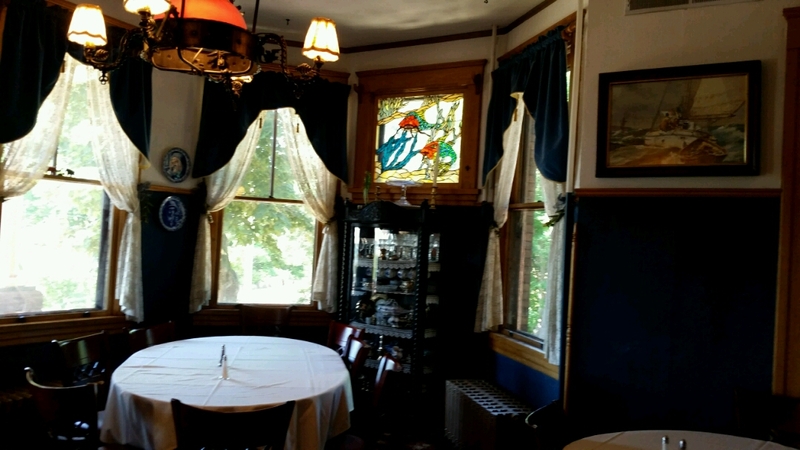 We ate some great Thai food in Ames, Iowa, really great. Little hole in the wall place with a faded menu on the wall, but awesome cooking. I don't know exactly when things changed. At one point Erin and Anah started to disagree hotly and I changed seats with her. And then there was Iowa which stretched out on either side of us, a sea of corn, with nary a weed and the islands of trees that surround all the factory farm operations. Then we ran into endless construction, the GPS assigned us a new route which made no sense, and we had to detour around an accident which added another 45 minutes. All told, we were on the road for 14 hours, but arrived safely at our destination, a wee bit wonky, but intact. We spent the morning of the next day exploring Ashland. Sometimes referred to as the town of murals, it earns that name easily. 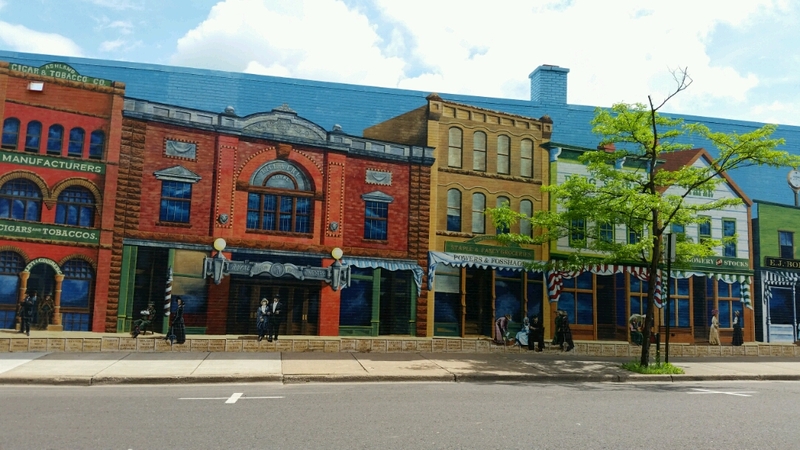 Buildings everywhere sported murals depicting town history. Quite well done. Later we went on to Bayfield about 20 miles away, wanting to check out the venue for the concert that evening and see what Bayfield had to offer. While there we discovered "The Fat Radish," a farm to market cafe with food to die for. Erin had fish tacos, I went for the special which was a lamb pot pie, and Anah opted for a roast beef sandwich with french fries. We all stole some of her fries, yum. The concert was uplifting, quite literally. By holding onto the seats in front of me (old church pews) I was able to jump. Been a while since I've done that. Ziggy really sounded good. He did a few of his dad's songs and that brought the whole crowd to life. Lots of folks around my age there and danged if we can't still dance. 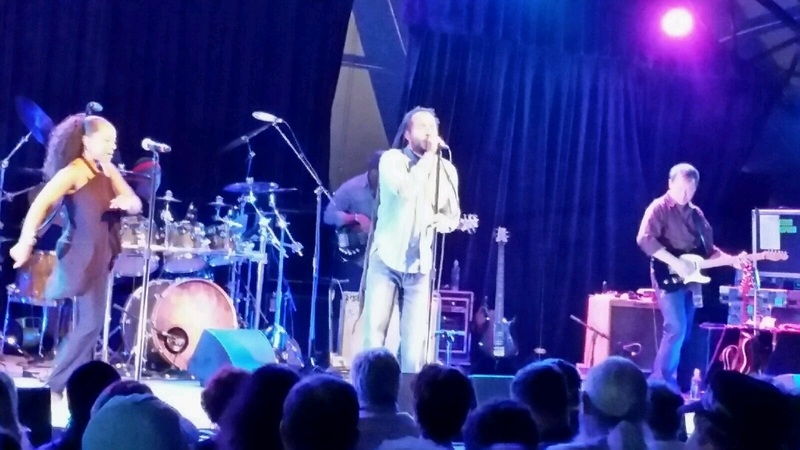 Always good to be surrounded by the positive vibrations of people singing and dancing to reggae music. LOVE IT! Love the people. Several times I had to sit and rest for a bit and during one of those lulls, hands magically appeared from behind me and gave me the most rejuvenating back rub ever. Looked around and saw a lovely young woman and we clasped hands for a moment. Magic. I LOVE IT! Woke up the next morning surprised that I was able to walk, but no damage done by all the jumping. We roused ourselves again and decided to take the ferry to Madeline Island. Fun. We walked the boardwalk down to the beach and walked the shoreline picking up rocks. Lake Superior is beautiful. Back to Bayfield where I scored some Wisconsin cheese at a local grocery. If I'd known it was so good I would have bought more, but so it goes. Ate some of the monterey jack that is marbled with bleu last night, oh my..great on burgers. Enjoyed white fish locally caught for dinner, one of the best meals we ate. Hard to choose as this was one trip where we didn't have a bad meal. I've traveled too many times to places where you couldn't find a good restaurant but no so on this one. Which reminds we that we had breakfast at the Rittenhouse Hotel where the food was good, not great, but the house itself made up for any lack. Forecasts had been gloomy with rain showing up every day. Once again the weatherman was wrong and we had a small shower one morning, but the rest of the time, it was lovely with sunny skies and cool breezes. Much lower humidity than in MO, a real plus for me. The trip home was uneventful. I rode in the back seat all the way and read most of the time. We were up at 5 a.m. and on the road by 5:30. Back home at 5, stopped to eat a couple of times and the usual pee breaks and stretch times. We've all decided all future car trips will be limited to 8 hrs total. Erin was exhausted. In fact, we're all still tired. But still smiling. For sure it was awesome! I can certainly understand wanting to limit the time in a car. Anything over five hours is just too long for me. Way too many road trips as a kid. That house was filled with stained glass, just lovely. Tired and smiling is a great way to end a trip. Sounds fun! That mural is amazing. I was quite fooled at first - thought it was a real row of buildings in front of a warehouse. That's a long time in a car. 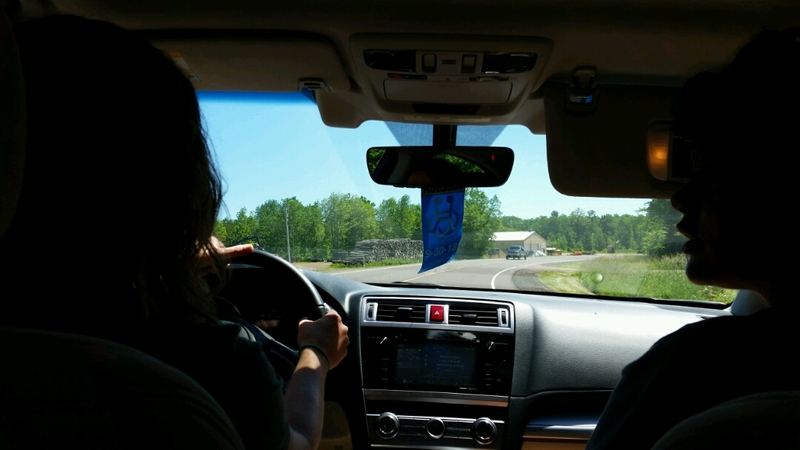 Sometimes the drive can be a major good part of a trip though - talking and being together. Everything sounds wonderful. Good to get away. I love Reggae. The murals were amazing, very well done. We had great moments while traveling, singing, talking, I love road trips.